ACORN, America’s largest grassroots community organizing group, became a major player in the 2008 presidential election that resulted in Barack Obama’s victory. Big businesses, Republicans and Right-wing activists took issue with the group, firing accusations of voter fraud and government waste at the left-leaning organization. The conservative opposition found unexpected allies in a pair of amateur journalists who posed as a pimp and prostitute hoping to expose ACORN via hidden-camera. The ensuing political drama spawned the now-omnipresent Breitbart Media, and served as a prescient foreshadowing of today’s political climate. In an age where fake news and truthiness obscure reality, ACORN and the Firestorm tells a deep, uniquely fair, moving story about what lies beneath a divided America. Two election cycles before Donald Trump famously declared the existence of rampant voter fraud, ACORN, a national community-organizing group, became the target of a similar claim. With a 400,000 strong, grassroots membership, in 38 states, ACORN stood at the height of its power. For decades, the controversial anti-poverty organization fought to empower marginalized communities. ACORN won a lobbying campaign that forced President Bush to increase the national minimum wage, saved thousands of people from foreclosure, and fought against predatory lending (presciently, a decade before the Great Recession). Uniquely, ACORN also operated on a local level, helping to clean up parks, put stop lights at dangerous intersections, and fight to improve neighborhood schools. Leading up to the 2008 election, ACORN helped to register 1.3 million voters, mostly low-income minorities, in swing states. When some of those registration cards appeared fraudulent, Right Wing activists and politicians singled out ACORN as a conspiratorial criminal organization. Strategists and pundits joined the chorus, casting ACORN, along with Reverend Wright, as frightening figures from Obama’s past. When Hannah Giles, a 20 year old journalism student, raised by conservative parents, heard about ACORN in the news, she became fascinated. She conceived of an investigation into the organization that involved a hidden camera, a fake prostitute and a YouTube video. Never in her wildest imagination could she guess that within a year, she would become a Fox News darling, put Breitbart on the map and bring ACORN to its knees. Bertha Lewis, the CEO of ACORN, also unaware of the firestorm to come, felt hopeful about her organization’s recent run in the media. Maybe it could be an opportunity to discuss the real work ACORN had been doing, the crucial, on the ground, everyday work it takes to move the needle ever so slightly to improve the lives of the country’s working poor. As a black woman, born to a teenage mother in a Florida migrant camp, and raised in South Philly, Bertha believed in Obama’s promise. After all, he had something in common with her: he too started out as a community organizer. ACORN won many battles before, but now, with an ally in the White House, actual systemic change seemed possible. ACORN and the Firestorm unfolds through the stories of these two women on opposite sides of the political spectrum, as well as through the eyes of ACORN staff, (like founder, Wade Rathke), members (like Travis Munnerlyn and Maude Hurd), and ACORN’s opposition, including Republican Congressman Steve King. 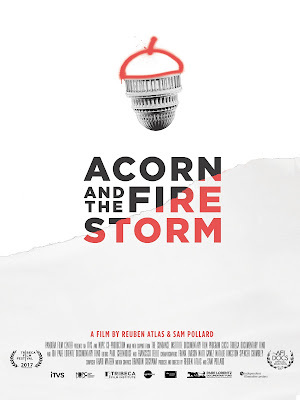 A complex and even-handed political drama emerges, that pits the history of ACORN’s rise against the ferocity of the salacious video takedown, encapsulating the conflicts and contradictions of our political present.